Profiles of birds and beasts can be made with hands, a light and a screen. 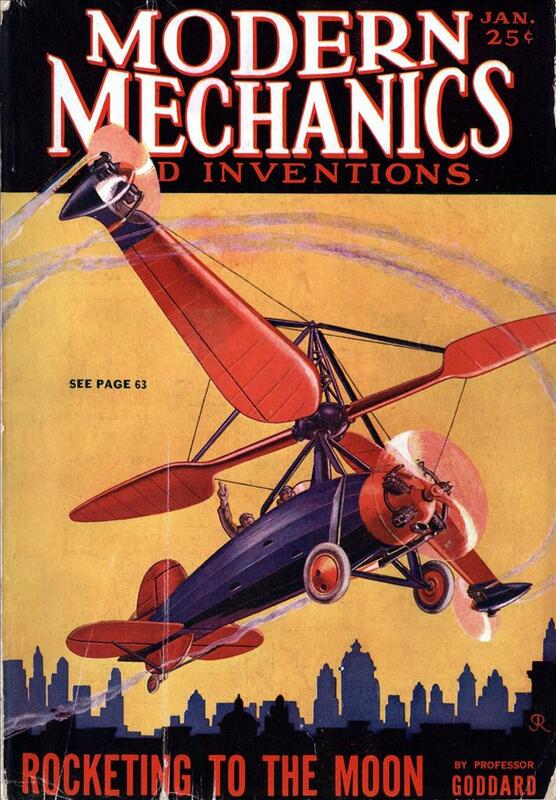 This feature explains how anyone can cast the shadows of sixteen different figures, an accomplishment which will provide many full evenings of entertainment for either children or adults. Ordinary sheet provides the screen for shadow entertainment. Strong electric bulb can be provided with home-made reflector and a cardboard shield — all the equipment needed for highly entertaining home program based on complete details in this article. NO DOUBT all of you know a few ways to cast bird or animal resembling shadows upon the wall. One who has a dozen or more ways to hold his hands for this purpose will easily afford an interesting hour of evening’s fun. And if he chooses to show his ability at a party, he will be as much in demand at others as a good amateur magician. 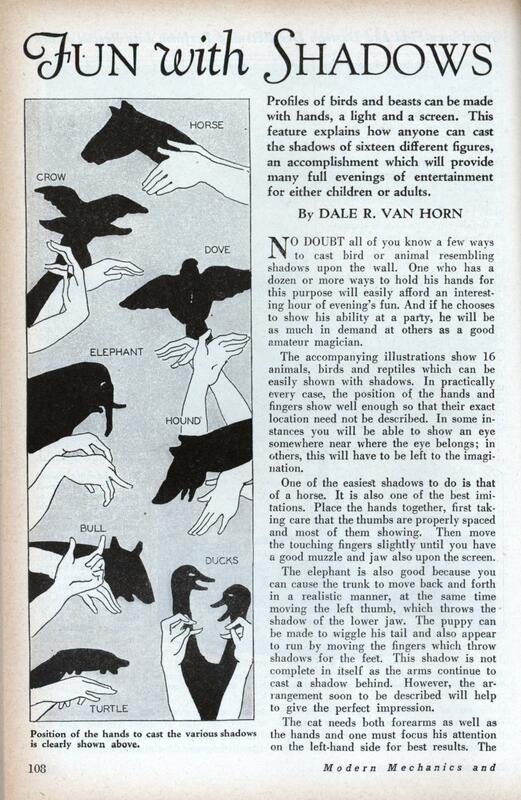 The accompanying illustrations show 16 animals, birds and reptiles which can be easily shown with shadows. In practically every case, the position of the hands and fingers show well enough so that their exact location need not be described. In some instances you will be able to show an eye somewhere near where the eye belongs; in others, this will have to be left to the imagination. One of the easiest shadows to do is that of a horse. It is also one of the best imitations. Place the hands together, first taking care that the thumbs are properly spaced and most of them showing. Then move the touching fingers slightly until you have a good muzzle and jaw also upon the screen. The elephant is also good because you can cause the trunk to move back and forth in a realistic manner, at the same time moving the left thumb, which throws the shadow of the lower jaw. The puppy can be made to wiggle his tail and also appear to run by moving the fingers which throw shadows for the feet. This shadow is not complete in itself as the arms continue to cast a shadow behind. However, the arrangement soon to be described will help to give the perfect impression. The cat needs both forearms as well as the hands and one must focus his attention on the left-hand side for best results. The shield described later will help to minimize this defect however. All you have to do to give the spider shadow is to lock the thumbs together and spread the fingers. Wiggling them will heighten the effect. The turtle is somewhat like the puppy but it is minus tail and to omit this the left thumb is turned down. The crow can be made to fly seemingly by slowly moving the fingers of both hands up and down in unison. The hound can be made to close its mouth for a moment then, quite naturally, open it again and pant. These are only a few of the shadows possible and with some practice you will be able to evolve other combinations of fingers to produce other results. The fingers should be exercised frequently to facilitate imitating various kinds of shadows. Begin by spreading and closing the hands, then moving one finger away from the other and back again; then two away and back, then three away and back. The light should have a shield to throw a circle of light upon the screen. Then any portion of shadow not wanted, such as the right hand side of the cat or the south end of the puppy (going north) can be merged with the shadow cast by the shield. A good apparatus is to fix a 100-watt bulb in a socket on top of a portable stand with flexible cord and switch in connection. Over this light set a tin can with the bottom fitting snugly to exclude light. A hole one inch in diameter is then made in the side of the can and through this issues the light to be used. Now cut from a large sheet of stiff cardboard, a hole 10 inches in diameter and provide this also with a support so that it can be set in front of the light and on the same level. The hands are then manipulated between the light and the shield. A sheet hung on the wall serves as a screen. How about a “flipped” bird? I flash these signs all the time. It indicates what gang I’m associated with….yo, homey!